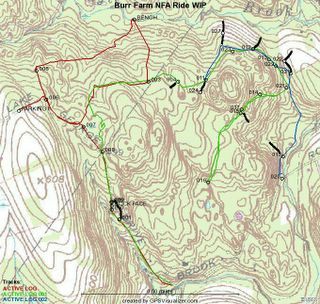 Final Burr Farm, Newtown Forest Association Lands, Open Space Ride map. 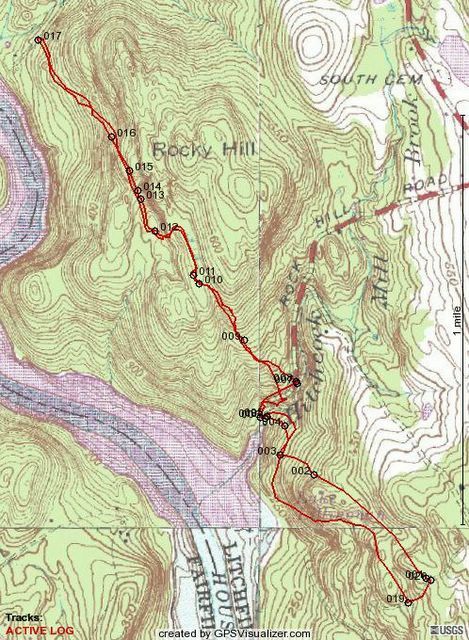 The little circles are waypoints that mark either interesting features trail junctures or deadends. If you want to download the GPX data, I would recommend going to Crankfire.com where you get can get the individual trails or I think the whole shooting match. 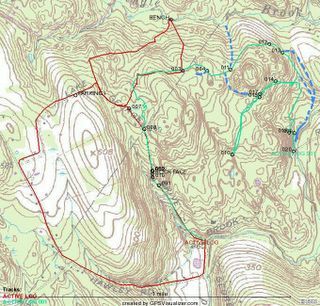 Once I get up and running with Bikerag's mapping software, I will have update on that site as well. Interesting geologic feature on the blue trail, surprisingly not marked on the map. This slab of rock is independent from the one its sitting on and it doesn't wobbel at all. This feature is right in the middle of blue trail as you head down to the old mica mine. Rode six miles today with Paul, a friend of mine from work. It was really, really hot but still a great place to ride for newbies. This place is primarily laden with alot of dual track and if want single track, you have to look for it. When you find it, take it! All sorts of little jumps and obstactles on these little side trips. 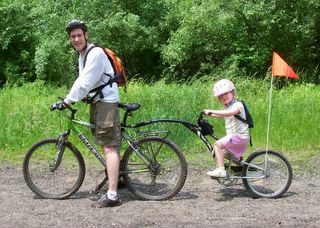 I will definitely return, in fact, some of the dual track was so flat, I will be bringing my daughter here for a trailer bike ride. Found a really great trail (green) that follows along the banks of the Dinglebrook, crosses over the main trail that connects Burr Farm to the NFA lands and then winds its way back to the trail (yellow) I found the first time but decided it wasn't going to lead to anything good. 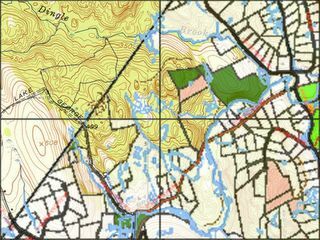 If you want to ride these trails, I would recommend parking at either Pond Brook Boat Ramp located off Hanover Rd in Newtown or the Burr Farm openspace park. If you park at Pond Ramp, take a right when leaving the parking area (onto Hanover Rd) and take the first left, prior to a hill. This is Pond Brook Road. After crossing the brook whence the road's name comes from, the road turns to dirt. Immediately after the next bridge, approximately half a mile down the road you will cross the brook again. On the West side of the bridge, turn right. Follow the trail as it follows the course of the stream and it will gradually move inland. At the point where the trail turns a sharp right and goes through a stone wall you see two dead trees about 10 feet apart. Proceed straight through, keeping the stone wall on your right and follow the stone wall until you see a big oak tree on the other side of a stream bed (dry now, but wetter in fall and early spring). Other side of the oak tree is the green trail. Best route on this trail is to ride it counter clockwise, unless you like to hike your bike. 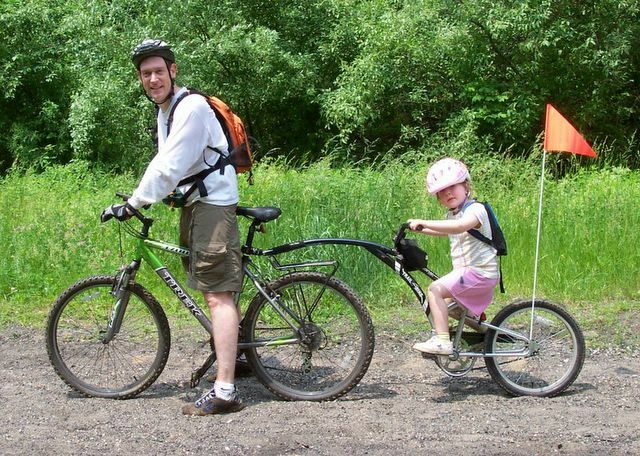 If you want to ride the Burr Farm Open Space loop, I would recommend riding it clockwise. 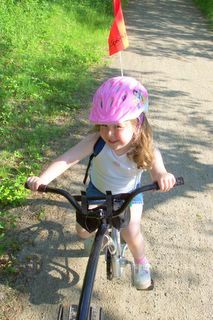 The climb from the bench at Dinglebrook on the ride is really gradual. When I got back to my house after riding I found two ticks attached me. I thought they were deer ticks but I could be mistaken. After removing them, I took them to the town health department where they will get tested for Lyme Disease. The health department gave me a cool frisbee for doing this. Later that day, I went to the doctors office for a dose of Doxycyclene - I am not taking any chances. So, here are the results from this morning's ride. 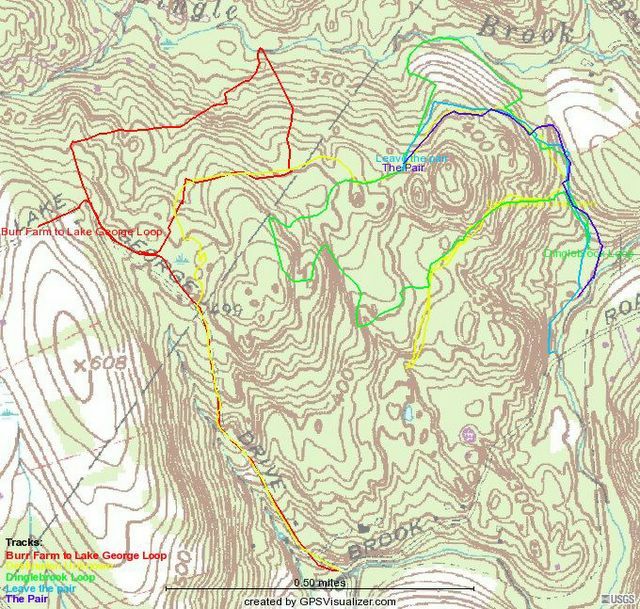 The green track is from today's ride, the red is my initial Burr Farm OS ride, the dashed blue lines trails that may or may not exist (I will explain, later). As you can see I didn't quite find the loop that I was looking for by the fact that I had to turn around (appoint 16). 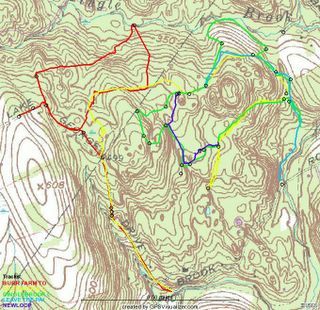 At WP 15 there appeared to be a trail that may head down to Pond Brook but I wasn't sure. 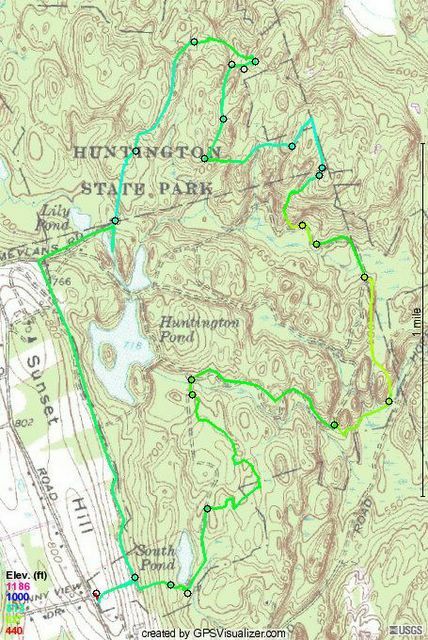 There might also be a trail that hooks back to the main trail, that is why I put the blue dashed line because I don't really remember. 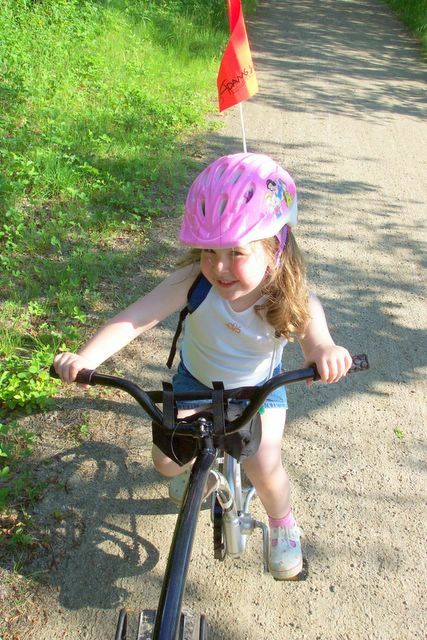 What I do remember about this location was trying to up a small stream bank, hitting a rock, and going Endo (over the handle bars). That was fun. The trail that leaves the red trail at WP 3 is a nice ride, nothing too steep or technical, in fact you can really get going through there. 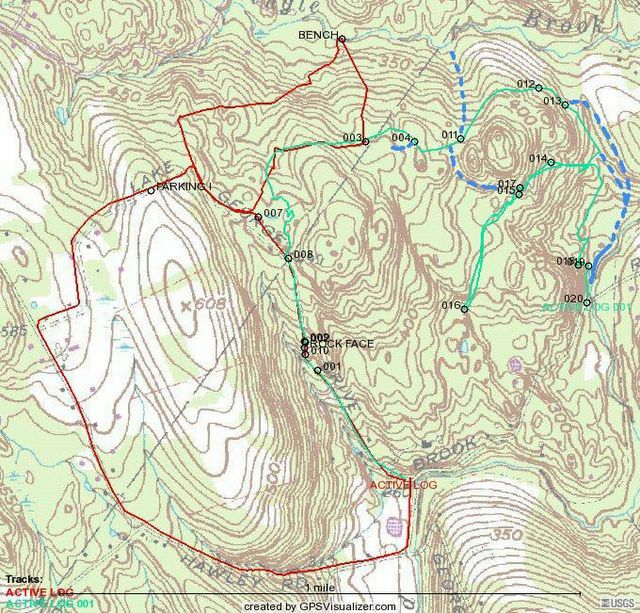 At WP, 4 there is a trail that intersects that was marked with orange engineer tape. 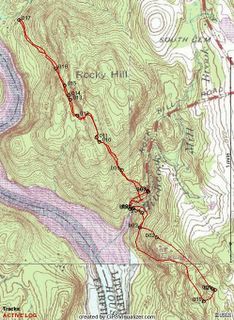 At WP 11, there is a trail that branches to the north and heads down hill. Might have to see where that goes on the next ride. At WP 12, there is a nice stand of pines. WP 13 there was trail branching off from here that headed down the hill and looked to go towards the fields (shown on the topo from the previous post). I think this might lead to the trail along Pond Brook. After turning back from WP 16 I probably should of headed down the hill from WP 15. It really didn't look like a trail but it would have mostlikely brought me to the one that I found after back tracking almost half way back to WP 13. 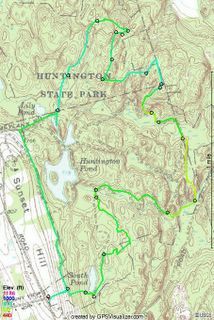 As you can see, I had to bushwhack until I found a trail that took me to Pond Brook. 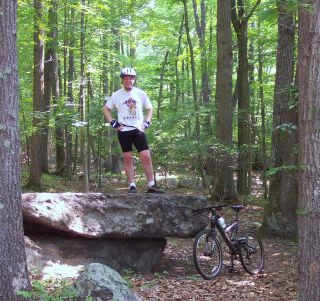 The next time I ride this, I am going to try it from the trail along Pond Brook and see where it leads. 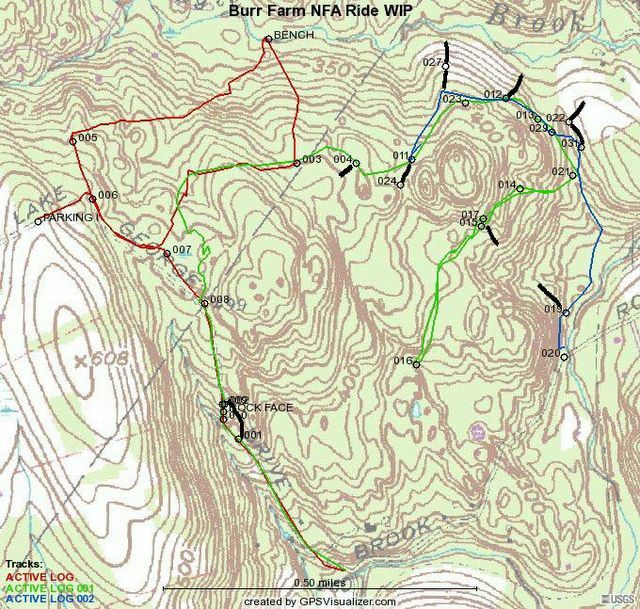 Hopefully it will connect at WP 13 which combined with the rest of the trails will be an excellent additional to my Burr Farm OS Ride Map. These trails are green trails but there are quite a few nearby rollers to venture out on. Combined with a run down to the bench on Dingle Brook and then back up towards the Burr Farm OS Parking lot, will make an excellent workout ride.